Crosley Model 515 (Fiver) 5-Tube 2-Band Superhet. 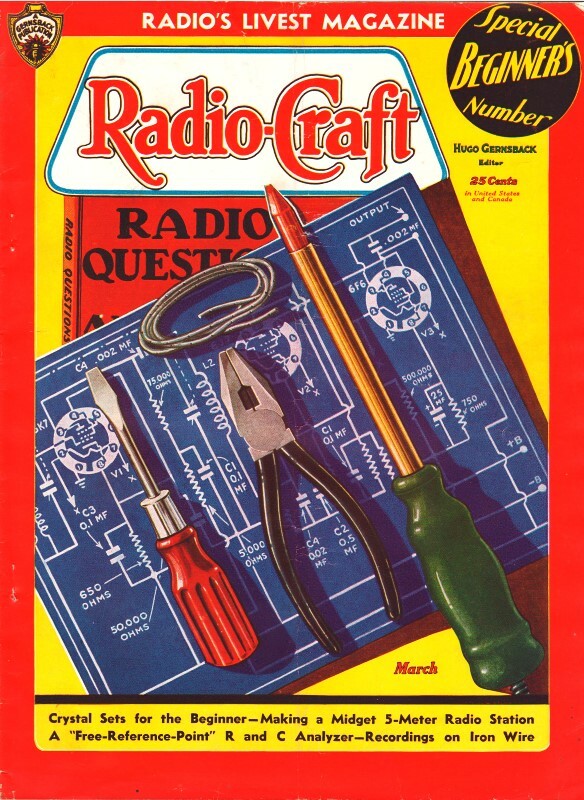 This is another Radio Service Data Sheet that appeared in the March 1936 edition of Radio-Craft magazine. I post this schematic and functional description of the Crosley Model 515 (Fiver) 5-Tube 2-Band Superhet radio manufacturers' publications for the benefit of hobbyists and archivists who might be searching for such information either in a effort to restore a radio to working condition, or to collect archival information. When aligning the I.F. amplifier of this set, keep the service oscillator lead well away from the tubes. It is attached to the cap of V1. Tuning condenser must be at lowest capacity. Volume control, total 8,000 ohms, 200 ohms fixed. Tube V5 has 4.9 V. on the filament; the others, 6.3 V. Total power consumption is 50 W. The R.F. circuits are aligned at 1,570 for the oscillator and 1,400 for the ant. section. The police band does not need aligning.